The Year of "STOP IT!" People are claiming to be "offended" over inconsequential matters, and I believe they want to draw attention to themselves and try to gain power over others. It has been rightly said that these tinhorns are effectively saying, "I have no control over my emotions, so I want to make others change their lifestyles and coddle my feelings". Or words to that effect. 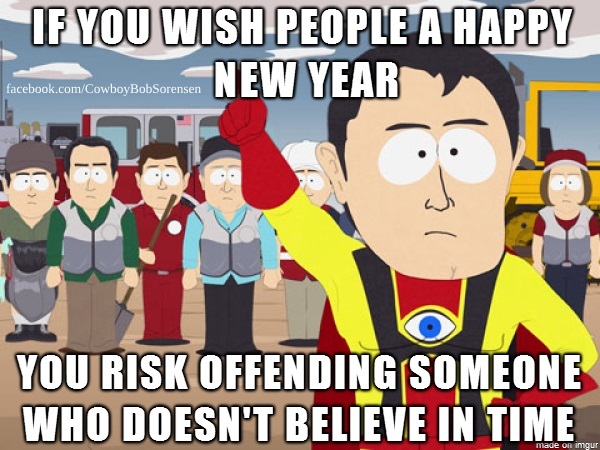 The above image was inspired partly by Brad Stine's remarks about people saying, "Happy holidays" because they don't want to offend someone who doesn't believe in Christmas. Other holidays, people call it what it is: "Happy Valentines Day — Ooh! Do you believe in love?" I reckon that some folks just look for things to cry about. One problem with this is that municipalities, courts, businesses, or whatever give credence to nonsense. For that matter, I'm offended on occasion, but I don't file complaints. (But then, it's not expedient for people to invest in the concerns of a while male heterosexual biblical creationist Christian. I was extremely offended by this satanic gingerbread Christmas house at my workplace. Didn't file a complaint, though.) The problem of honoring petty complaints is exaacerbated by the cheapening of actual reasons for offense. F'rinstance, accusations of "racism" that are nonexistent may cause people to be reluctant to believe genuine complaints. Similarly, calling people who reject evolution "science deniers" is loathsome folderol. The title I originally wanted was, "Let's Make 2017 the Year of 'Stop It! Get Over Your Narcissism! Grow Up!'" Maybe we should tell the whiners, the delicate hothouse flower leftistss who need "safe spaces" and are too neurotic to deal with the harsh realities of life to stop it! No more coddling and validating. Leave the complaints and trauma therapy for serious concerns, you savvy? Here's the URL if you want to use this video thingie on social media and stuff: http://gph.is/2g4qkIN and the source for the entire video clip is here.